The Pennsylvania Horticultural Society (PHS) is a nonprofit membership organization founded in 1827. PHS provides great events, activities, and publications for novice gardeners, experienced horticulturists, and flower lovers of all ages. Greensgrow Farms is a nationally recognized leader in urban farming and is open to the public from early spring through Christmas. A small but dedicated staff runs a multifaceted operation, including a nursery, a farm market, and a Community Supported Agriculture (CSA) program. It is located at 2501 E. Cumberland Street in Philadelphia. 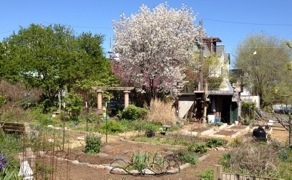 “You Bet Your Garden” is a radio program on WHYY. The Website contains a great deal of information for gardeners. Here are some other websites with resources for the community gardener. Interested in learning about edible plants, some you can find growing wild in our garden. Here’s a resource.